Buy Catherine Lee Neifing artwork at a discount and help her pay medical bills! IN BETTER TIMES: Catherine Lee Neifing will be offering her works at a discount in her home studio on Oct. 19 in an effort to pay for growing medical bills. 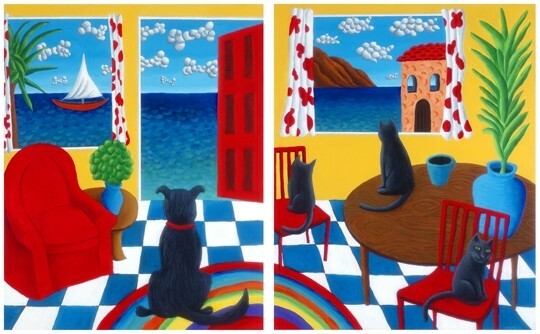 The work of Catherine Lee Neifing literally bursts with hyper-intense color, riotous color, peel-your-eyelids-off color! Her work celebrates life and exudes relaxation, often set in a sort of tropical paradise where the sun always shines. For Cathy, however, life hasn’t been so sunny lately. On top of everything else, Cathy also has a respiratory infection this week, hence the e-mail interview. And for the record, Cathy is not a freeloader! HER LAST PAINTING: Thanks to as yet undiagnosed neurological problems and other health concerns, Cathy hasn’t made a new painting since 2011. This, “Dog / Cat Window to the Sea,” was her last. “I have insurance, but obviously it does not pay for everything,” she wrote, hence the big art selloff. It’s a great chance to collect some originals or reproductions! Cathy moved here in 1988 and quickly became an integral part of the arts scene. She was the first place winner of the Art at the Mall’s Central Coast Plaza art competition 1989; she showed her work at the Off the Wall show at French Pavilion 1990; and had several shows at Jamaica You. “That’s where I met JACK LALANNE!” she gushed. 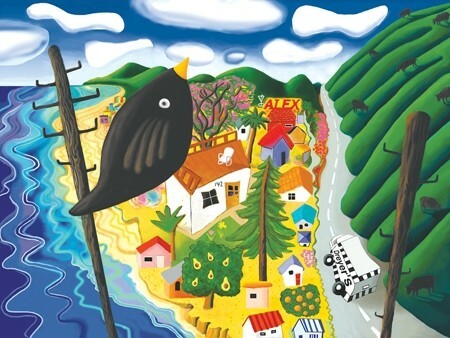 ABOVE SHELL BEACH: Many of Cathy’s paintings depict local landscapes; all are colorful, cheerful celebrations of life. She also taught art for 14 years at Allan Hancock College (painting, landscape art, computer fine art) and also at Cuesta College. Clearly, she was incredibly active, and she’s done so much for the local arts community. I certainly hope the community can now give back to this vibrant lady. In addition to opening her home studio on Oct. 19, she’s got a major retrospective of her work on display at TD Parker Salon and Gallery. BUY SOME ART, PAY SOME MEDICAL BILLS: The colorful work of Catherine Lee Neifing is at TD Parker Salon & Gallery (2078 Parker St., SLO) through Nov 30. 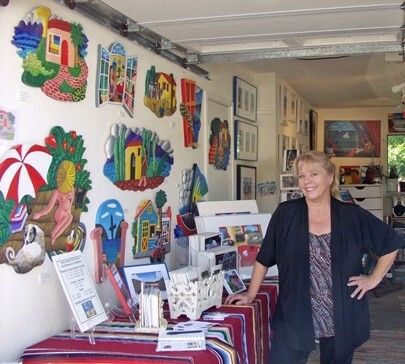 On Saturday, Oct. 19, from 10 a.m. to 5 p.m., Neifing will open her home studio (521 Allen St., Arroyo Grande, at the corner of Allen and Cross Streets) to sell work at 25 to 50 percent off. Neifing has been ill for over a year, and though she has insurance, it hasn’t covered all her medical expenses. “There will be original paintings, drawings, prints, and cards for sale,” said Neifing. “Do your Christmas shopping early!” Prices start as little at $4. It’s strange to discover this formerly energetic friend slowed by this mystery neurological disorder, especially an artist as prolific as Cathy, but she hasn’t made a painting in nearly three years! Cathy, ever resourceful, is not ready to lay down yet! Come support this longtime member of the arts community and don’t miss your chance to get a Catherine Lee Neifing original or print at a great deal! Contact Glen Starkey at gstarkey@newtimesslo.com.